7 Quick Questions To Know You Better—I'd Love To Read Your Answers! / Hey, EEP! 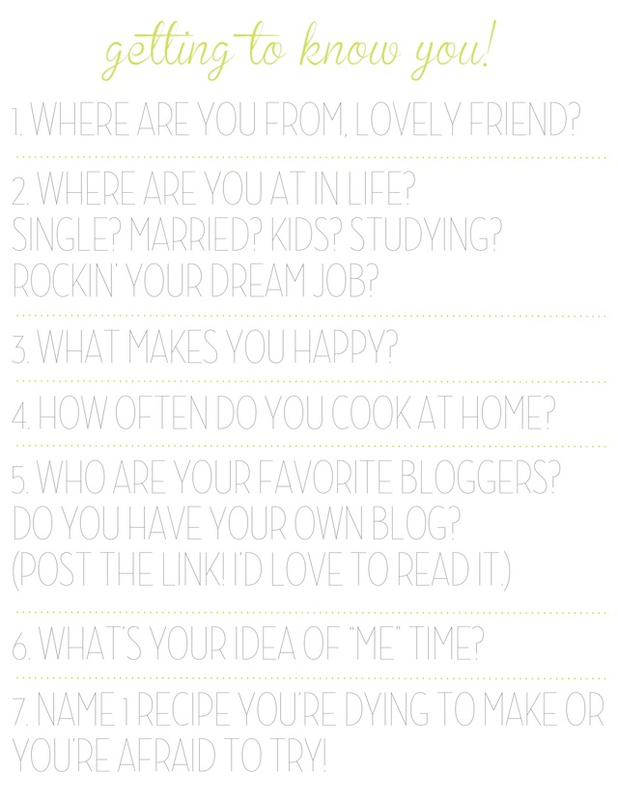 7 Quick Questions To Know You Better—I'd Love To Read Your Answers! 1. Life-long New Yorker (woohoo!) currently living in Downtown Brooklyn or RAMBO, right-after-Manhattan-bridge-overpass. 2. Where am I at? I feel like a good place! Neither single nor married but living with my truly wonderful boyfriend and it couldn't be better! I feel blessed to have a dreamy job. I'm taking on new challenges there and through the blog. Free time is chockfull of family, friends and new projects. It feels lovely! 3. Oh gosh: My family (which very much so include boyfriend now,) seeing my brilliant/beautiful/creative friends! I wish I did it more often, traveling, dreaming of traveling, STRIPES, the smell of anything baking in the oven, babies who speak French, puppies who are so small they step on their ears, walking around the city—anywhere really—very early in the morning when everyone's still quiet and asleep, a great cup of coffee, reading your comments (it always makes my day,) being outside, milkshakes, summer Fridays, the list goes on. 4. Every day at work. Probably 3-5 times a week at home (we go out often, so it varies). 5. ZOMG, there are so many! ...there are so many more! I'm obsessed with girl blogs. 6. Now that we have a giant bathtub, I've actually taken to soaking (which is so unlike me)! But a nice warm bath while reading New York Magazine, with music and maybe a little wine? Clique but so lovely! OR lounging in the park with a notebook and my camera. That's it for me! What about YOU!? I'll bite because I would love to hear from the silent readers who I hope read my blog. I came across your blog when I emailed you a question about your awesome icing color chart you did at food network. 2. I'm married and we're expecting our first child through adoption soon! 4. I cook at home 2-3 nights a week and my husband also cooks. I know, super lucky. We eat most of our meals at home together. 6. Like you, I love reading a book during an evening soak for some me time. I also love playing in volleyball leagues. 7. I would like to try to make English muffins soon.